Alysa Liu performs her Free Skate at the 2019 Geico U.S. National Figure Skating Championships. 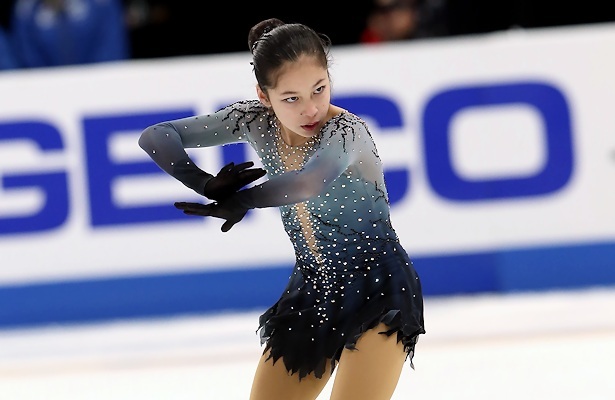 In her debut on the senior level, Alysa Liu from Oakland, Calif., became the youngest U.S. Ladies Champion in history on Friday night, edging out defending champion Bradie Tennell for the gold at the 2019 Geico U.S. National Figure Skating Championships. Mariah Bell slipped to third for her second bronze, and was followed by debutant Hanna Harrell. Liu impressed when she landed two triple Axels in her routine, one in combination with a double toe. The only flaw in her routine was an edge call on a triple flip. Otherwise, the diminutive 13-year-old landed a total of seven solid triple jumps. She also earned level 4s on all other elements, and finished first in the free skate and overall (143.62 / 217.51). The teen also landed a triple Axel in the short, becoming the first U.S. lady to land three triple Axels in one competition. Due to her age, Liu is ineligible for senior international competitions, such as the World Championships, but she said she looks forward to learning from the Russian skaters once she is eligible. She also mentioned she enjoys riding her bike, playing video games, and playing tag in the park in her free time. Bell finished second in the free skate (142.10) but still stayed in third place with a total score of 212.40. The 22-year-old fell on a triple Lutz and received an edge call on another, but was otherwise solid in her expressive routine to music from The Piano and “Experience.” She earned high grades of execution (GOE) for all other elements, as well as level 4s on her spins. Ting Cui, who was 12th after short program, put out a third-place free skate (139.66) which featured six clean triple jumps along with level 4 spins. The only flaw was an underrotation on the Euler of a triple flip-Euler-triple Salchow. Her final score of 194.30 boosted her up to fifth overall. Tennell left points on the table when she stepped out on the back end of a triple Lutz-triple loop and later fell on an underrotated triple Lutz that was intended to be a combination. The 2018 Internationaux de France bronze medalist showed level 4 spins and footwork with high GOEs throughout her program and earned the second highest Program Component score of the event, but her fourth-place finish (136.99) in the free skate was not enough to defend her crown. Her total score was 213.59. Harrell put out a respectable and solid routine to “La Cumparsita” and “Adios Nonino” in her debut on the senior level. Her program featured six triple jumps, including a triple Lutz-triple toe which earned +4s and +5s GOEs across the board, and she finished in fourth place overall fourth place (134.95 / 203.11). Megan Wessenberg rounded out the top six ladies (182.55) followed by Amber Glenn (180.73). As Liu is not yet age-eligible for senior level international competitions, Tennell, Bell, and Cui were named to the Four Continents. Tennell and Bell will also be competing at the World Figure Skating Championships.